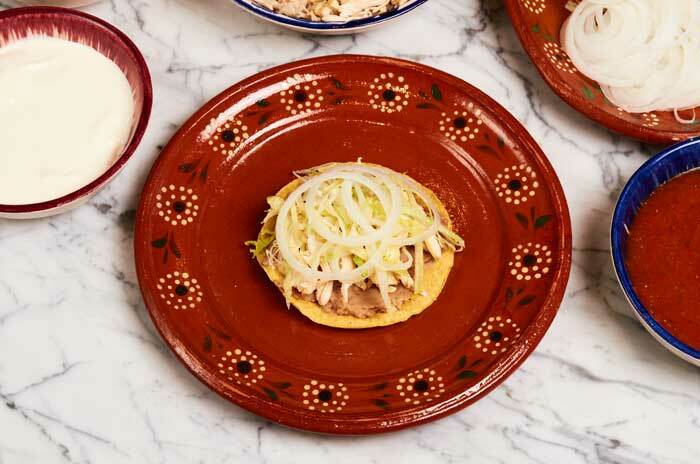 Tostadas are crunchy tortillas like hard taco shells but flat. Tostadas also refer to a prepared dish in which the crunchy tostadas are topped with refried beans, shredded chicken, shredded iceberg lettuce, thinly sliced white onion, Mexican cream, crumbly cheese and your favorite salsa. We prepared these with our homemade salsa roja. 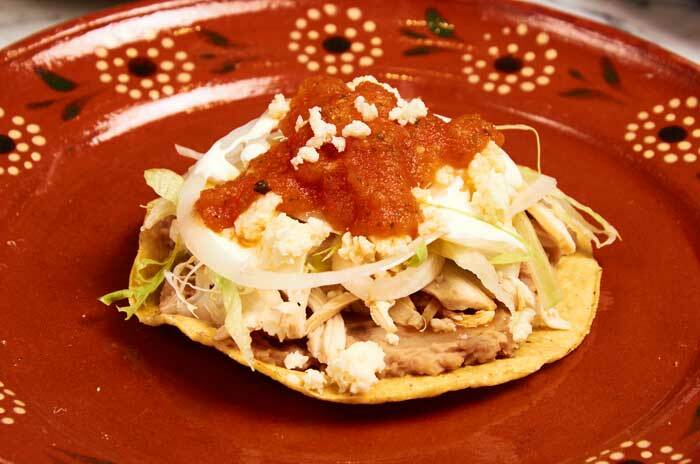 Tostadas are so good and so easy to prepare! 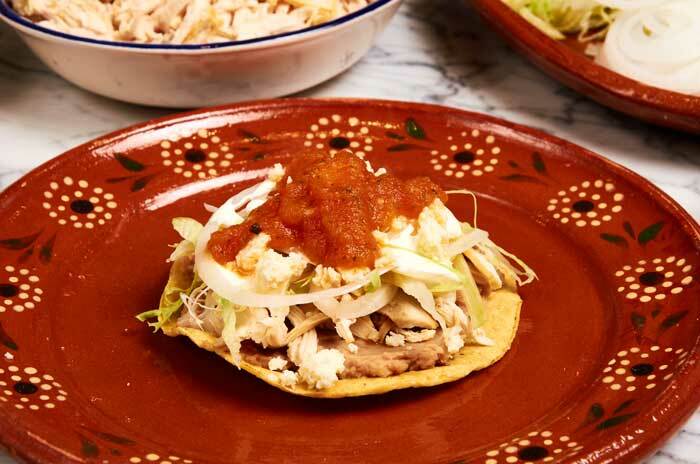 Tostadas are great for parties and get-togethers. 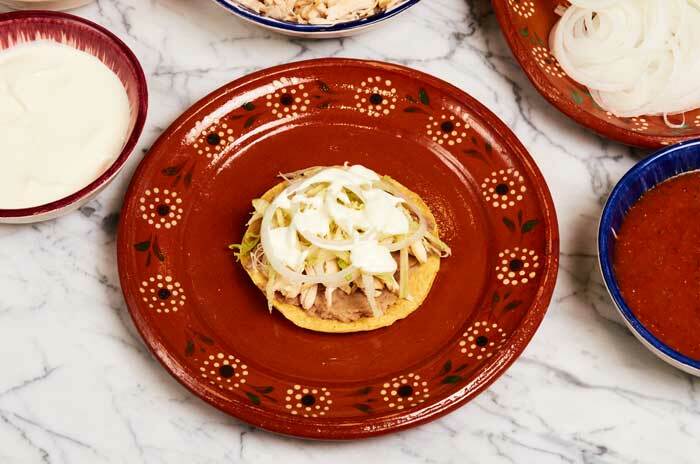 Everything is prepped in advance so that everyone can prepare their tostadas to their liking. Don’t like cream? Want extra chicken? Extra salsa? Make em however you want. 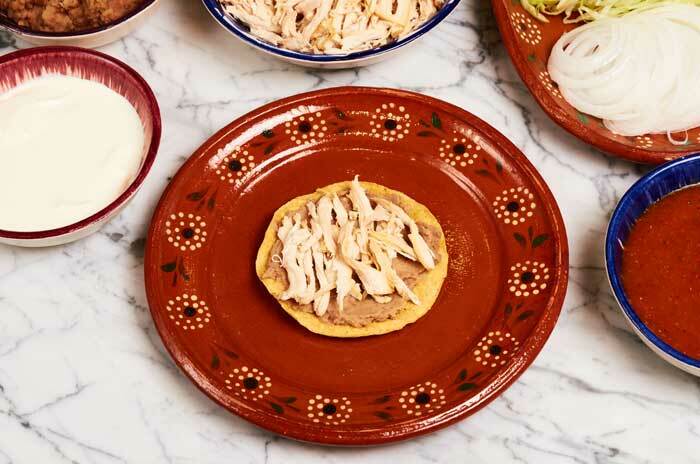 Set up your tostada making station for quick and easy preparation. 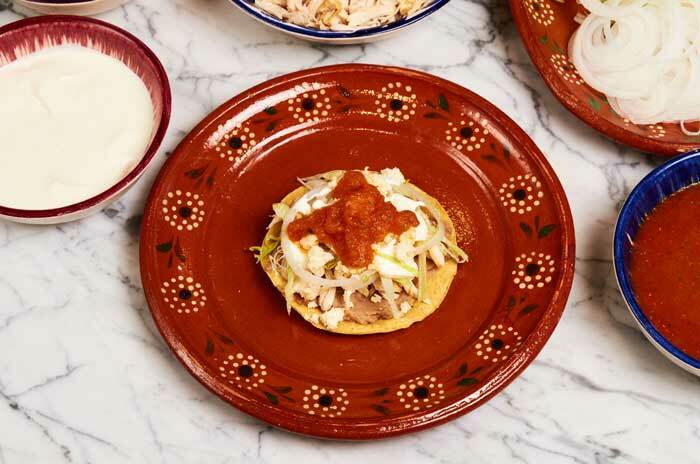 Tostadas are great with any type of salsa. If you are serving them for a party put out a variety of salsas. Consider any of these: salsa verde, cascabel salsa, or restaurant salsa. The beans are served warm and the rest of the ingredients at room temperature. Ready to prepare some tostadas. I guess you don’t really make chicken tostadas you build them. Stack the ingredients and build flavor. Just follow the steps and then enjoy. 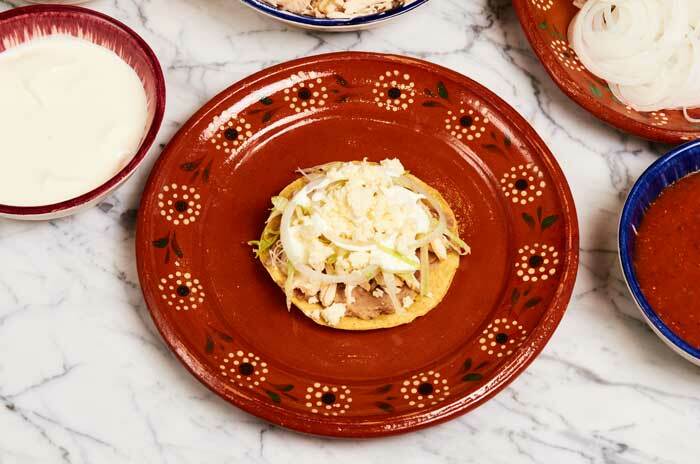 Kids love making their own tostadas. Start by spreading refried beans on a tostada. Add thinly sliced white onion. Add a few dollops of Mexican cream. Sprinkle with some crumbly cheese, queso ranchero or queso fresco. Finally, top with your favorite salsa. You want the chicken to be really tender. 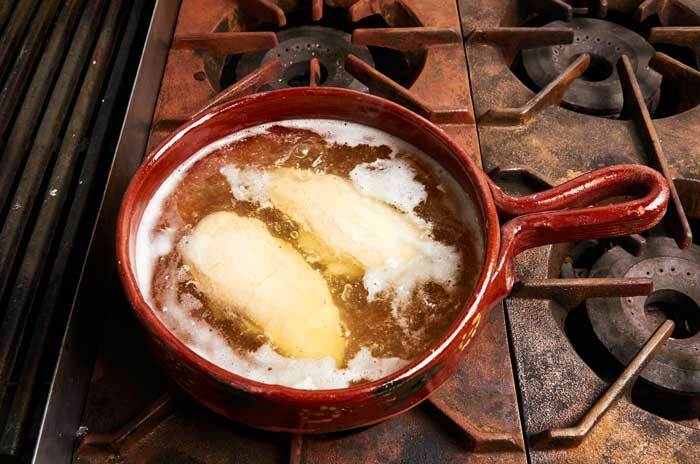 To cook the chicken perfectly, start by adding the chicken breasts to cold water and then bring the water to a gentle boil. Cook for about 20 minutes until fully cooked. Remove them from the water and allow them to cool. Shred by hand. 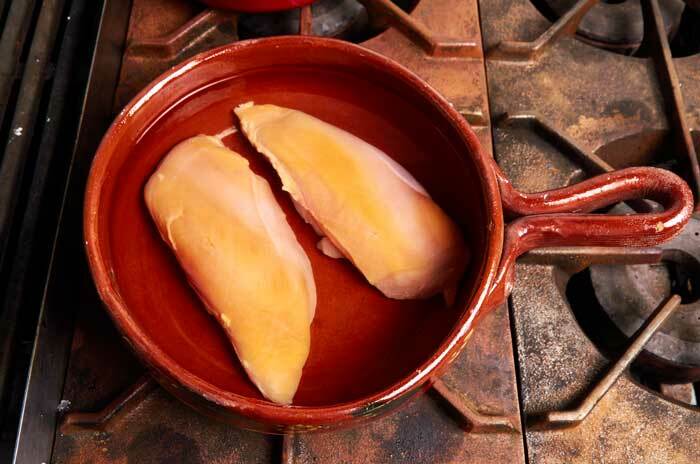 Cut each chicken breast into thirds and then tear off thin strips of chicken with your fingers. If you have never shredded chicken before at first it is really slow and tedious. After a few minutes you will get the hang of it and be able to work must faster. TIP: Make a double batch of shredded chicken and freeze half to use later. Add chicken breasts to cold water. 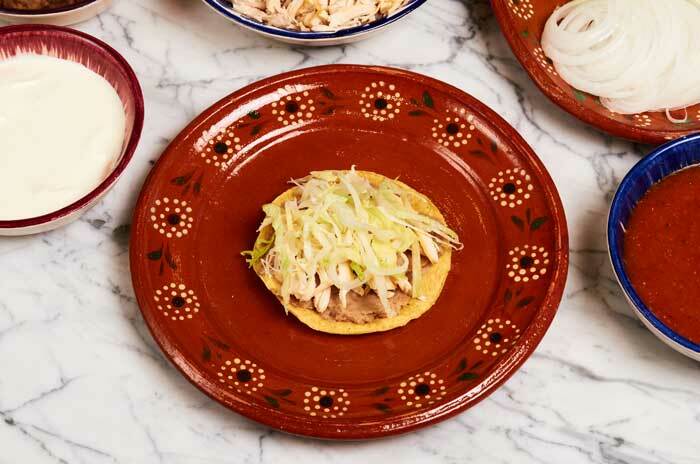 Mexican chicken tostadas, crunchy corn tortillas topped with refried beans, shredded chicken, shredded iceberg lettuce, thinly sliced white onion, Mexican cream, crumbly cheese and your favorite salsa. 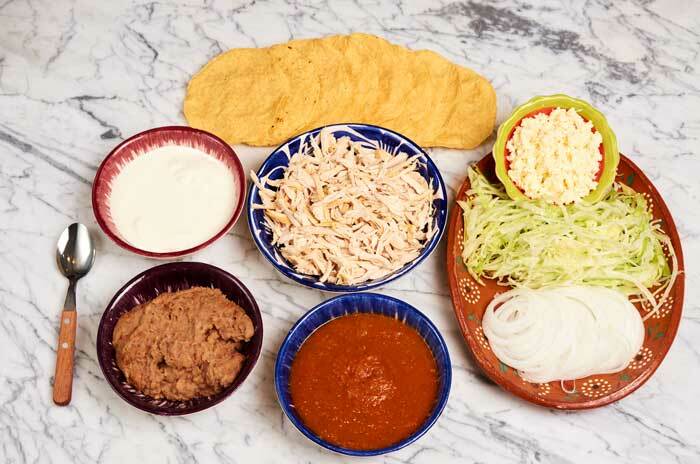 Any of these cheeses are good for preparing tostadas: queso ranchero, queso panela, queso fresco or grated mozzarella. Red onions add a colorful touch.